Country girl and bestselling novelist Rachael Treasure had worked hard to build a long-dreamed-of lifestyle on her own patch of dirt in Tasmania’s rugged and beautiful wilderness. But through the breakdown of her marriage, Rachael lost her family farm and, in her words, lost her way in life. Discovering an all-new compass to live by, she took her two kids and her dogs and left the beaten path. Intensive farming, men on the land and women in the home – everywhere Rachael looked she saw ongoing harm to the soil and the foodchain. 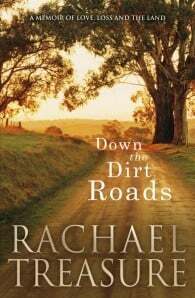 By going down the dirt roads and getting back to grassroots, she discovered another set of stories about country life in Australia, and a different way to live on the land. From her rebel granny to pioneering farmers and passionate animal handlers, Rachael became inspired by fresh ways to do things. Down the Dirt Roads starts as a heartfelt and moving insight into the life of a single mother displaced from her home, and becomes a groundbreaking and powerful book about healing, health and hope. Nourishing and sustaining, it presents a practical and positive vision of what life on our land could become. Rachael Treasure lives in southern rural Tasmania with her two young children and an extended family of Kelpies, chooks, horses, sheep and a time-share Jack Russell. She is passionate about encouraging non-readers to read, as well as inspiring farmers to consider regenerative agricultural practices. Rachael's first novel, Jillaroo, was a bestseller and has become one of Australia's iconic works of fiction, inspiring other country women to contribute to the genre of contemporary rural literature. She has written four other bestselling novels and two collections of short stories.